LUGANO, Switzerland, Oct. 22, 2018 /PRNewswire/ -- After the recent announcement of the Dominium real estate project as the Ardor blockchain-as-a-service platform's official fourth "child" blockchain, Jelurida today publicly launched the Ardor Learning Hub. This new resource provides an extensive array of documentation and tutorials. These tools are specifically designed to aid businesses and their IT teams to begin tangibly considering how to best add value to their offerings by leveraging the blockchain. Jelurida is excited to announce a new initiative to expand its community of developers and business partners. The Ardor Online Hackathon 2018 runs from today through 6 December 2018 and is an open call for developers anywhere to participate in three challenges to use lightweight contracts to automate business processes on the blockchain. The challenges cover currency exchanges, data storage and streaming, and identity verification. Jelurida will be awarding first, second, and third place prizes equivalent to US$4000, US$2000, and US$1000 for each challenge. Details can be found on Jelurida's website and developers can sign up here to receive email updates related to the Hackathon. Ardor - The Only "Full Blockchain as a Service"
Jelurida released a bold statement calling out Amazon AWS and Microsoft Azure for providing "Cloud Blockchain as a Service." 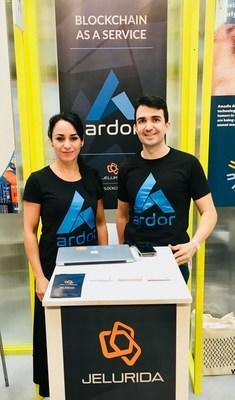 Jelurida went on to thoroughly demonstrate how the Ardor platform, as the only "Full Blockchain as a Service" offering, provides upgraded decentralized security and quicker launch times for new businesses integrating with the blockchain (full statement). In early October, Jelurida released Ardor Version 2.1.2 with one new feature on testnet and three business-ready features on mainnet: easy-to-integrate Lightweight Contracts that avoid costly data migrations (testnet), foolproof Transaction Vouchers that eliminate wire fraud, instant crypto exchanges with Changelly directly in the Ardor interface, and five bundler templates for hedging monthly business transaction fees on the blockchain while sponsoring end user fees (full statement).